INKFEST is a biennial art festival run by INKMASTERS, a not-for-profit group, which aims to raise the profile of printmaking as an art form in Cairns, enhance regional skills through ongoing workshops and provide opportunities for artists by promoting their work to a wide audience. 2014 INKFEST includes Inkmasters Print Exhibition at TANKS Art Centre 1-24 August as well as a range of associated activities including artists-in-residence, the BIG PRINT Community Event and other collaborative projects. Local artists and printmakers, both indigenous and mainstream, can tell their culturally diverse stories through works displayed in the context of highly respected national and international artists. The exhibition offers selected artists the enhanced possibility of sales and the opportunity to extend their representation in corporate collections via our sponsor pre-commitment program. Additionally, for the first time, successful artists participating in the Inkmasters Print Exhibition will have the opportunity to also receive four cash awards from a $5000 prize pool of funds made available by the Copyright Agency Cultural Fund and BDO Cairns. Artists can receive the Anna Eglitis Award for excellence in printmaking for $2000, along with three further awards for $1000 each. The selection and judging will be undertaken by artist-printmaker Brian Robinson; artist-printmaker and Director of Monsoon Publishing, Ronald McBurnie; and artist and Senior Lecturer at James Cook University, Dr Robyn Glade-Wright. The announcement of the recipients of the awards will be made at the official launch, Friday August 1 from 6pm. David Kaus, Senior Curator at the Australian National Museum, will be guest speaker at the official launch. The Tanks Arts Centre is located at Collins Avenue, Edge Hill, Cairns. The 2014 Inkfest is supported by Art Queensland and a range of Program Partners. 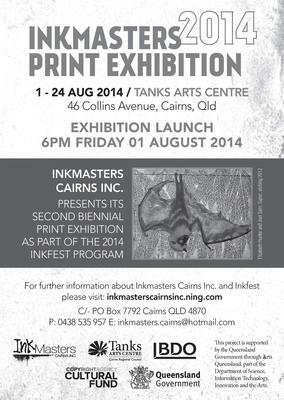 Submissions to Inkmasters Print Exhibition will be accepted until June 2nd, 2014.